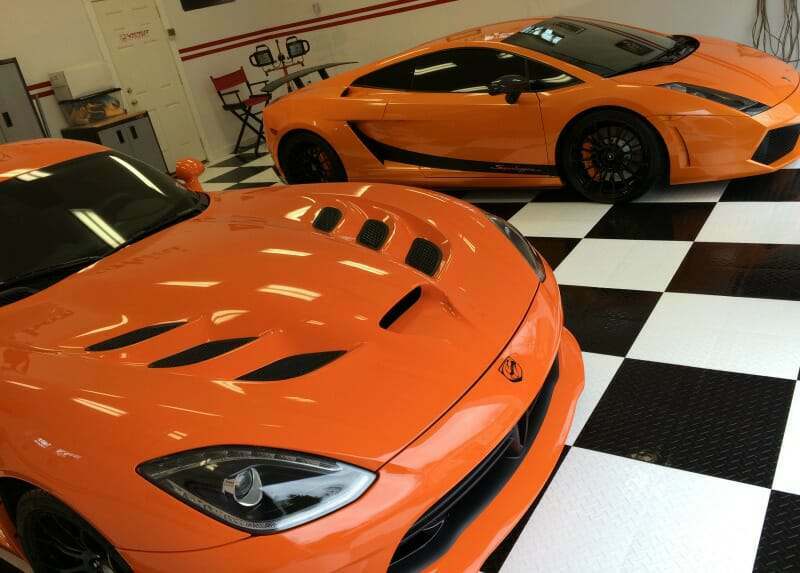 So what do you do when you have two orange and exotic summer cars that need a nice place to stay in the winter? Well Jon R from Huntington, New York found himself asking this same question. His answer? Instead of running them down to Florida for the winter, he decided to park them in their own garage outfitted with RaceDeck interlocking floor tiles. 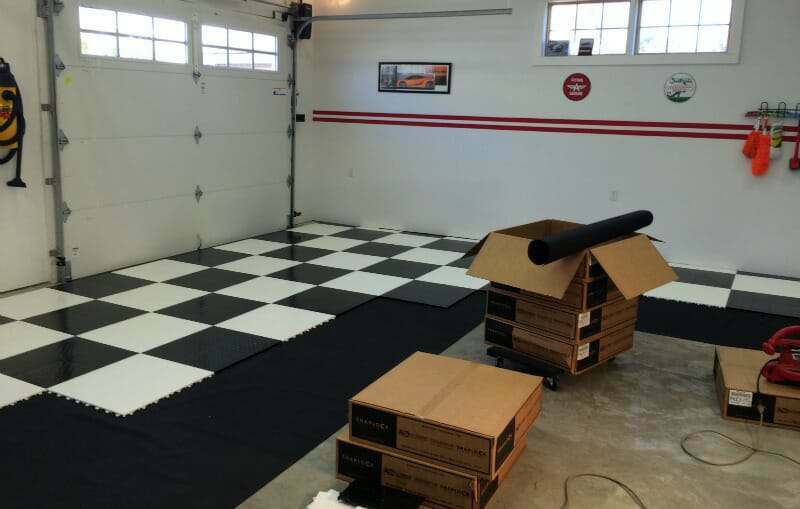 When reviewing the many garage flooring options available, Jon decided to use RaceDeck TuffShield® interlocking tiles in the Diamond® pattern. For colors he chose the classic black and white checker board design. 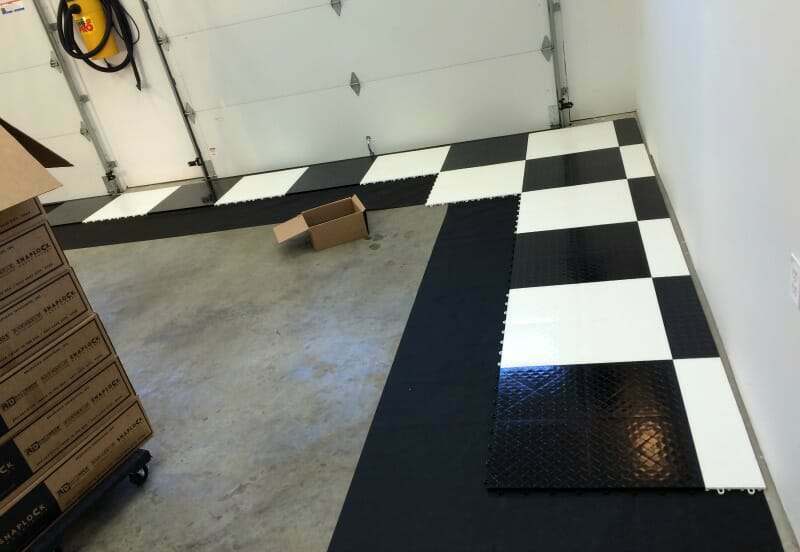 These U.S. made garage floor tiles are considered the premier of RaceDeck’s tile line up. What makes them unique is the patented polished look that RaceDeck applies to the surface of the tile. Available in both their Diamond® and CircleTrac® design patterns, these tiles have a high gloss finish that reflects light and gives the garage floor a showroom type finish. As it turns out, this is exactly what Jon has accomplished. With 730 ft² of garage floor to cover, installation went smooth and easy. The only hiccup was that he had ordered the exact number of tiles he would need based on the square footage and had not considered additional tile for miss cuts or some indentations he has in a couple areas of the garage. This was easily remedied however with a call to RaceDeck to order the additional tiles needed. Tile was first laid in the corner along the front perimeter and outer edges of the garage floor. Once you get the initial two perimeters laid, it’s just a matter of lying down the tiles and snapping them in with your feet or a rubber mallet. Though the size of the tiles is 12”x12”, he decided to lay the two colors in a 24”x24” pattern so as not to make the large floor look too busy. We think this was a good idea as it turned out looking fantastic. It also made installation even easier since RaceDeck ships their tiles snapped together in 24” x 24” squares. As a result, he didn’t have to unsnap each square to separate the colors. Because Jon is a perfectionist and wanted things balanced (we can relate), he decided to go through the extra work of cutting the tiles for the two outside perimeters in half so that he would end up with 6” of alternating black and white tile on either side of the garage floor instead of 12” on one side. For making cuts Jon used a table saw with a sharp fine blade. He said cuts were easy to make with no issues. You most likely are wondering what the black cloth is and why it’s being laid down on the floor first. As it turns out, Jon’s biggest fear about choosing interlocking garage tiles is the hollow clicky clack sound that some people occasionally complain about when walking across the floor. The remedy for such complaints is to lay the tile on top of synthetic landscape cloth. The cloth will actually absorb some of the sound and reduce the clicking noise of the hard plastic contacting the cement. Being made of synthetic fibers, the cloth will not mold or mildew if it gets wet; it dries quickly, and will not deteriorate under the tile. Though noise complaints such as these are rare, Jon decided to lay the cloth down first as insurance against the possibility of having such a problem. The landscape cloth is inexpensive and easy to lie out in strips as you assemble the floor. We know some of you may be just as interested in the cars as you are the floor. We understand though, we love cars to! The reason Jon calls this his Twin V10 RaceDeck Garage is for the fact that both cars have V10 engines and are orange in color. The car on the left is a 2014 Dodge Viper Time Attack. Dodge only made 93 of these V10 beauties in Orange and Jon has one of them. 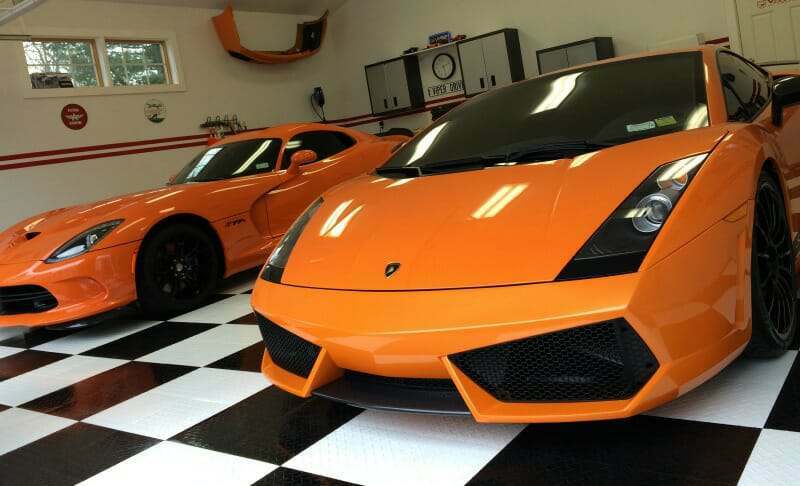 The car on the right is a 2008 Lamborghini Gallardo Superleggera in Arancio Borealis pearl orange. This V10 Supercar would make any garage look stunning regardless of the floor it sits on. 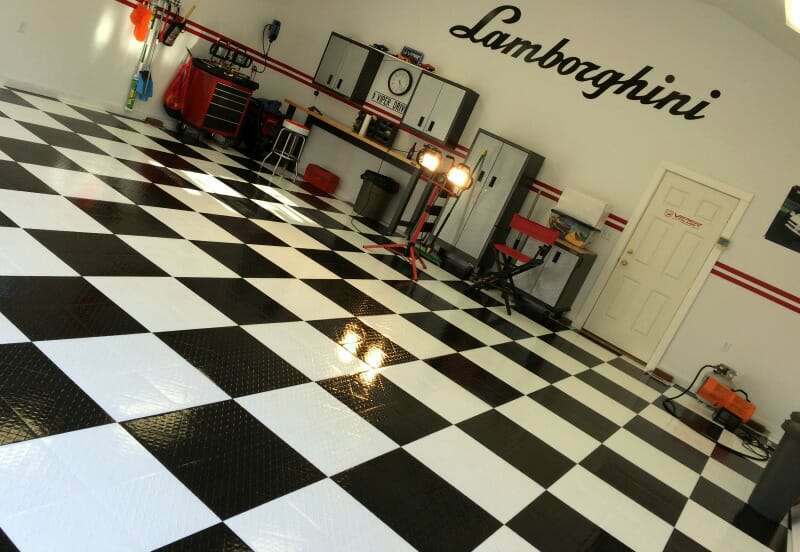 When asked about how hard it is to keep the floor clean, Jon stated that these would not be his first color choice for an everyday working garage. He did notice when he backed one of the cars in that some dirt marks had shown up on the white tile. We know from experience that dark colors like black show the dust easier as well. However, Jon did say that it wasn’t anything that a damp mop couldn’t handle and we would have to agree. One of the benefits of interlocking floor tiles is that they clean up very easily. He said it’s too early to tell yet, but he’s hoping that the addition money he paid for the “tough” part of the TuffShield® tile will hold true, though he knows that crawling around the floor will be much easier on the knees. One thing we at All Garage Floors can say for sure; We could live with any sound, no matter how unique, if we had to suffer with a garage like this one. what was the specific landscaping cloth used? There are synthetic, woven cloths that shed moisture, and most of the Black rolls I have seen, is solid plastic film like material. Any details would be appreciated. The polyethylene landscape cloth that you can purchase from your local home improvement center works great Patrick. Here is an example. It will not rot if it gets wet and also breathes which will allow moisture to wick away.